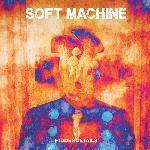 Brand new studio album by from legendary jazz-rock group Soft Machine - their first in 37 years! More information: In September 2018, Soft Machine released their new studio album 'Hidden Details'. This is the first Soft Machine album (as opposed to Soft Machine Legacy album) in 37 years, since 'In the Land of Cockayne'. The album features John Etheridge (guitar), Roy Babbington (bass), and John Marshall (drums), alongside Theo Travis on Tenor and Soprano saxes, flute and alto flute and Fender Rhodes electric piano. Theo Travis has written four tunes for the album and there are arrangements of two classic Soft Machine tracks – Out Bloody Rageous (from Third) and The Man who Waved at Trains (from Bundles). There are also various group improvisations. The music is broad ranging from psychedelia to jazz rock to free form improv' to simple pop-ish tunes to hypnotic mood pieces.